Once you've successfully integrated Leadfeeder to your Salesforce, and you have configured your Salesforce view, you can connect leads to Salesforce leads, accounts and opportunities. These may already exist in Salesforce, or you can create new ones directly from the Leadfeeder UI. STEP 2: First, you need to choose if you want to include existing visits from that lead in your Salesforce's account/lead. They'll show up in the section called Leadfeeder visits. 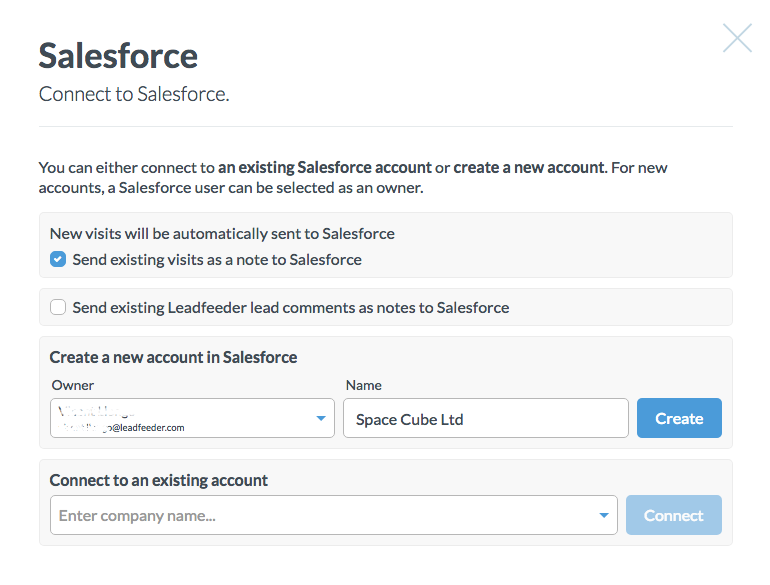 Alternatively, you can setup the integration to send only future visits of that Leadfeeder lead to Salesforce. b) Connect to an existing account/lead in Salesforce. STEP 4: After connecting a lead with Salesforce, visits will appear as you can see in the screenshot below. NOTE: With the Lightning UI, it will look a bit different.